How can I add a form to my site so that my visitors can post comments or contact me? In order to put a contact form on your site, click on the widget toolbox on the right hand side of the screen, and then click on the "Forms" folder. We have integrated with two great services that allow you to create custom forms for your site: Wufoo and Form Assembly. Both services offer free and paid plans, so you can select the one that is right for you. form service. Sign up for an account and create your form. When you are done click "get code." Copy the code and paste it into the SynthaSite dialog box. That's it, you will have your own custom form on your site and your responses will be managed in your Wufoo or Form Assembly account. You can then either reply to them personally or post their comments directly onto your site. hi Monique thanks for that but its not quite what i was asking. I don't want their feedback emailed to me I want it to remain on my site (here's hoping for only good feedback!!) kind of like a blog I suppose? We are working on a blogging platform, so once again I need to prevail on your patience. However, if you want feedback added directly to your site, you have a number of options using widgets from Widget box. You could add a guestbook, comment box, mini forum or chat room. Let me know if you can find something that suits you. ok Monique it'll be good once that is sorted - so much easier than creating forms and pasting them in etc - i have created a form but its not quite what i wanted but will do in the interim until the blogging platform is created. I'll use that once you have sorted it. I had a look at your message guestbook but i found that i was getting comments from other sites that were using it and i wasn't sure if that meant there was a problem with it or if that is supposed to happen. You have a super website and your sweets look yummy! However, I get some weird display problems when looking at your site. The content on your page appears on the far right of your screen and part of it is cut off. Please send me an email at support@synthasite.com and let me know what style you are using and if you have any custom HTML on your page as I would like to find out more about why this is happening. Which guest book did you use? If you have one on your site it should only have messages from visitors to your site. hi Monique i've sent an email as you suggested but my ignorance is total i'm afraid! I can't remember which template i used but i don't think there's any extra html on there (apart from the google adsense and the 2 forms from Wufoo). I tried the one you sent me a link for and when it was on my website i was getting comments from everywhere but nothing to do with the site so i removed it. I have found that if i refresh the page (when i'm visiting it properly) then it will go to the correct layout but of course my visitors aren't going to know that so i'd much rather have this problem solved! thank you for the compliment by the way - they taste rather good too!!! But know that this is a chat feature and the site which you submitted had added the text "tag" This particular chat has a free chat feature with ads placed on your chat feature and a paid service without ads. If you use this feature then after you have created your code simply insert it into a HTML widget. 1) In your site editor on the right scroll to the bottom of the "content" tab of the "content sidebar"
Your site will now have a great FREE and ad free chat feature that others can leave comments on your site. We would love to see your site could you include you URL so that we might share in your hard work? Sorry it is late and after midnight and I didn't think before I typed "We would love to see your site could you include you URL so that we might share in your hard work?" Great start and keep it up. I will for sure check back and see how your site grows. I am happy for you that you got meebo but we really don't need to go through the steps of going directly to the meebo site because Synthasite provided the shortcut for us already and I described the steps above. It is really so very quite simple. Sadly there is not a way presently to have visitors upload images to our sites as we are the only one who can do this. As to a type of guest book where visitors can submit short stories to your site I would use something like the Easy Comments Widget from Widgetbox. 3. In the Widget Box website search box search for "Easy Comments"
4. Customise the comment box size and name to your satisfaction and click on "get widget"
5. Copy the embed code, paste it back in the dialogue box on your SynthaSite and click ok! You will then have a place where people can leave comments. I use form smarts for the forms on my site. I have tried many services, and i find form smarts, so far, to be the best. you can find it at: http://formsmarts.com. note: my site doesn't seem to be working today for some reason. if it doesn't, try again tomorrow. I've been up against the same task. I currently find Wufoo to be the most versatile. And pretty easy to use. does anyone know where a UK based company can get a calender/appointment system free? the one on synthasite is for US only. monique wat exactly is a form? and does it cost anything? Hi day95 - a form is something that you can add to your site that visitors can fill out. For example, if you would like people to send you their name and email addresses - you can add the form to your site requesting those details. 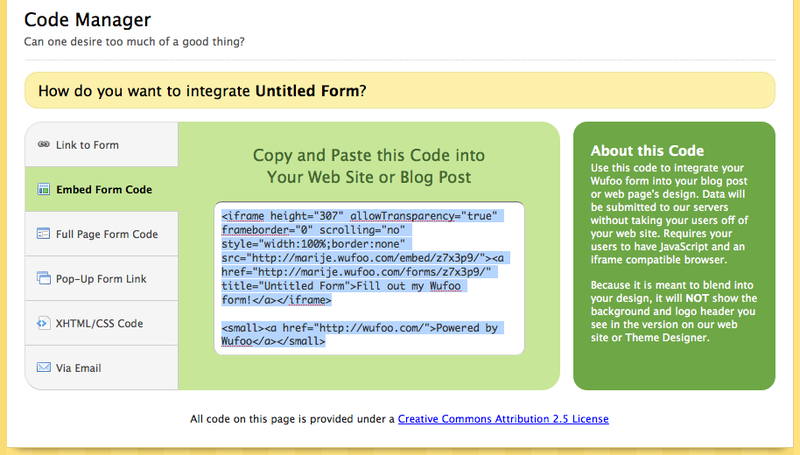 You can use either Wufoo or Form Assembly on your site for free. Hi bubun - we don't have a member register and login feature yet, but we hope to add it in future. We know that many people would like to have people register for accounts and have logins for their sites. We will need to do quite a bit of development to make this possible. OK, I have complete my web site yet I can not get the two forms I created to display on my site? I followed all instructions and it will not display complete form. I did not want people to be sent off my site while completing forms? It would be on my first page.....both forms I made another attempt and no display still? Your form will display on the page so that visitors can fill it out on your site. Just use jotform.com it is good becase you can make hundreds of forms for free no trial unlimited time its brilliant check it out!!!! Thanks for the tip! I will check it out. I did everything you instructed, using the links to form creating sites. However, the form pages is correctly linked but takes no input. Hi Bill - can you post a link to the page on your site that has the form? We'll be able to take a look and let you know what we think is happening.